To make myself feel better, I"ll pretend that this is the truth. Everyone has that junk drawer or in this case closet that just accumulates a bunch of crap over the years. It's the place you put something when you think to yourself.. "Oh, I'll definitely use that at some point". Or perhaps it just doesn't fit anywhere else so you think... "Oh, I'll just place this in here and then very soon I'll organize everything and find a perfect spot for it". This is where you insert that loud noise when you get the wrong answer on game show... ehhhhnnnnnttt! That item will sit in the drawer or closet.. or under the bed forever. So I exaggerate a bit on forever. However, it stays there a pretty long time until you finally get the motivation to take everything out and start from scratch. My taking everything our and starting from scratch required two large, black garbage bags. I feel great. 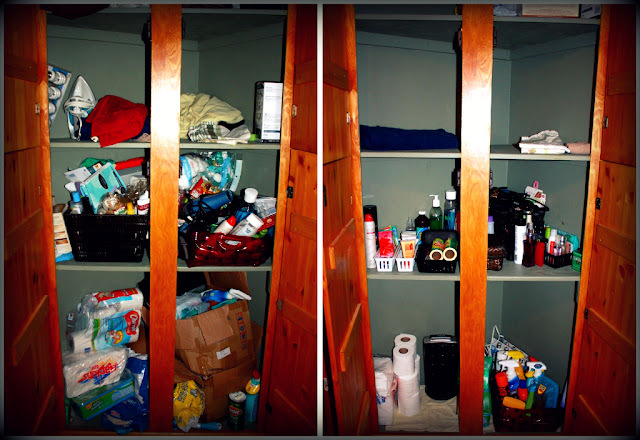 I no longer feel the stress of having to search for something in the closet or even avoid opening it when I show people around my house! Ah feel amazing at this moment and very accomplished! This is love, don't you agree? To feel stress free over something that has caused you so much anxiety? 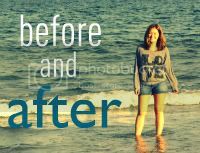 If you would like to share a little before and after in your life.. feel free to link it up here!